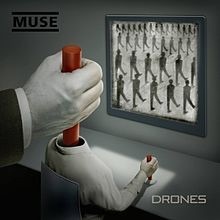 Album Review: Muse, Drones. – music waffle. Without doubt, the build up to this album has been a pretty masterful piece of PR. Ever since January, Muse have been using social media to drip feed photos and snippets from the studio, gradually sowing the seeds of the Drones concept and cultivating it into bloom. They managed to drop a UK Tour overnight in March at venues at the extremities of our nation, during which they they previewed it some of the new tracks, and have been steadily releasing a track here, a track there, so that plenty of it was public knowledge well before release, without the need for free streaming. This is one reason why I like Muse – they do a thorough job of taking an idea and following it right through. Everything is done professionally and properly. Matt Bellamy seems to have a brain hell bent on detail and perfection. In interviews he talks so quickly that at times I’ve wondered if his brain is seeped in Helium gas, so quickly does it fire. You just know that he has researched what goes on with drones extensively to get his background information. No half baked mishmash of seemingly unconnected and disparate elements. It’s the works. And that’s before we get to the efforts they put into making their live shows a top class experience. So to the Drones concept, inspired by the use of remote control killing machines in modern warfare. Life or death decisions can be made from such a distance that there is little impact on the human conscience. The album tells the tale of how one vulnerable person is indoctrinated to become a senseless killer as instructed by his Drill Sergeant. He goes full circle through conversion and subversion to realisation and redemption by the end. Despite the fact that so many songs were out there before the album’s release, it is still a revelation to listen to the full album as it tells a complete story, and I can’t imagine why you would do anything other than listen to the narrative as told. When touring the album you feel the songs need to be sung in order to get the full impact. In fact it lends itself hugely to being transformed into a rock musical or theatre show. There are shades of War Of The Worlds and Queen at their most operatic. Many tracks on the album are full on rock numbers: Psycho, The Handler and Defector are drop dead gorgeous and send a guitar lover quite weak at the knees. It proves that little in life beats a good rock riff. And while we are singing the praises of Matthew Bellamy, it’s worth acknowledging that he’s a damn good guitarist. The digits dance with particular dexterity on Reapers, and the falsetto hits the heights regularly. The band aimed to move away from experimentation with orchestral and electronic elements, back to the drum-guitar-bass trio, but it is anything but simplistic with that sound. As we get towards the back end of the story, the tone changes and Aftermath, with its echoes of One by U2, signals that the Superdrone is coming to his senses. It is Rice/Lloyd-Webber material, so Musical Theatre is it, and it starts to lead the story to its conclusion. Then The Globalist, a hugely ambitious track at 10 minutes long, chucks in a guitar blast that literally makes your knees buckle at what may come next. It doesn’t quite go where you think it might, but massive respect for daring to tread that path. The final track, Drones, sounds like a cloister of monks chanting their way to absolution. If you listened to these three tracks in isolation, you might never guess what had gone before, and first I found these final tracks (guitar blast aside) out of kilter with the rest of the album, but you have to accept it as part of the story telling process. It’s very reassuring to see Muse still rocking out with their seventh album – a round of applause for being reliable purveyors of a quality product.